The Staff Selection Commission has announced a big relief to the candidates who wanted to apply for the Selection Posts Phase-VI/2018 and thinking that they have missed the opportunity then a good news for you all that SSC has extended the last date. Yes, SSC has increased the last date to submit the application form for the post. As per the notification, the last date to submit the application form for Selection Posts Phase-VI/2018 has been increased to 12th October. Therefore, candidates who are interested in the post get one more week to submit their application till 5 pm. 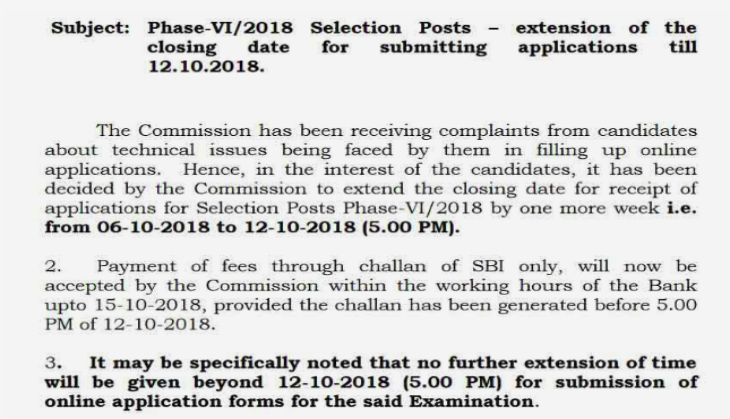 The reason behind the date extension has notified by the SSC is that the aspirants were complaining that there were difficulties to submit the application form due to technical issue due to which Commission decided to take this decision.